I love anything involving eggs. Omelets, egg salad, hard boiled eggs, deviled eggs, poached eggs, eggs over easy…pretty much anything! Eggs are a super healthy source of protein. So when I saw this delicious looking recipe in my Cooking Light Magazine, I had to try it out. Knowing that each serving is only 5 Weight Watchers SmartPoints (and 4 Weight Watchers Points Plus Value), makes it a no-brainer for me to put this recipe in my recipe box to make again in the future. They’re super easy to make. A little bit of preparation is required, but it’s so well worth it. Flatten out 6 slices of whole wheat bread with a rolling pin and cut the crusts off. Cut each slice in half diagonally and then brush each side of the bread with a little bit of melted butter and place into muffin cups. Here’s what the bread looks like in the muffin tin before baking them into crispy cups. Yes, I need new muffin tins. I guess you could say a lot of love went into these tins. Lightly spray muffin pan with cooking spray. 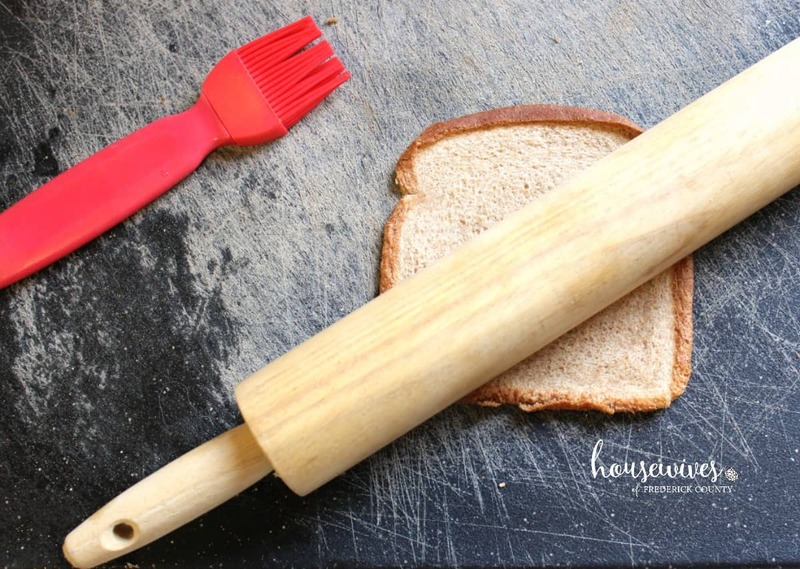 Flatten each bread slice with a rolling pin until very thin. Trim crusts off bread. Lightly brush both sides of bread slices with melted butter. Cut each bread slice in half diagonally. 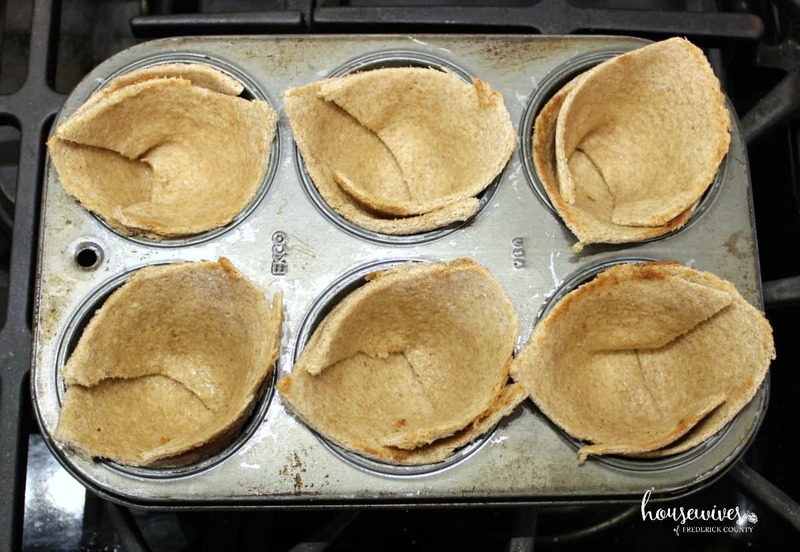 With cut sides facing, place 2 bread halves in each of 6 muffin cups, making sure to cover bottom entirely and allowing bread corners to extend above rims. Bake for 5 minutes or until bread is slightly firm. Remove pan from oven; sprinkle 2 teaspoons shredded cheese into each cup. Top each cup with 2 teaspoons chopped tomato. Crack 1 egg into each cup; sprinkle eggs evenly with salt and pepper. 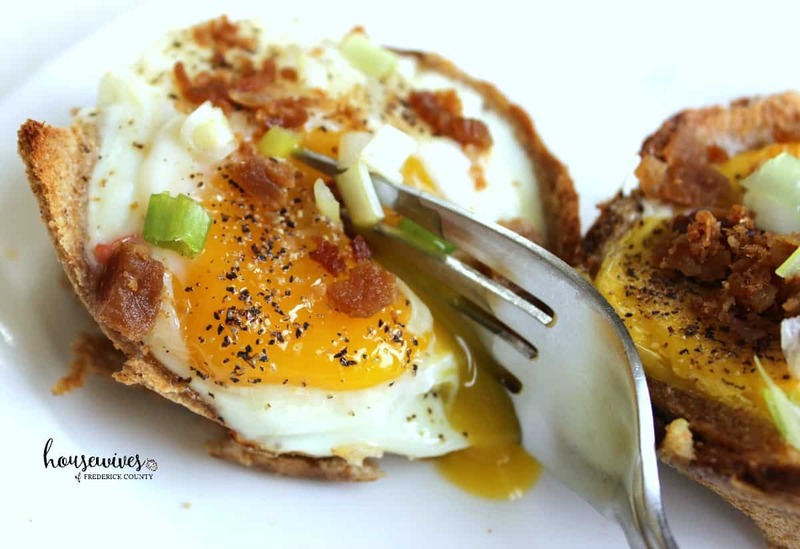 Bake an additional 18 to 20 minutes or until whites are set and yolks are still a bit runny. 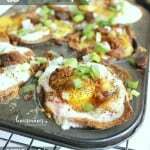 Remove egg cups from pan; sprinkle evenly with bacon & spring onions. 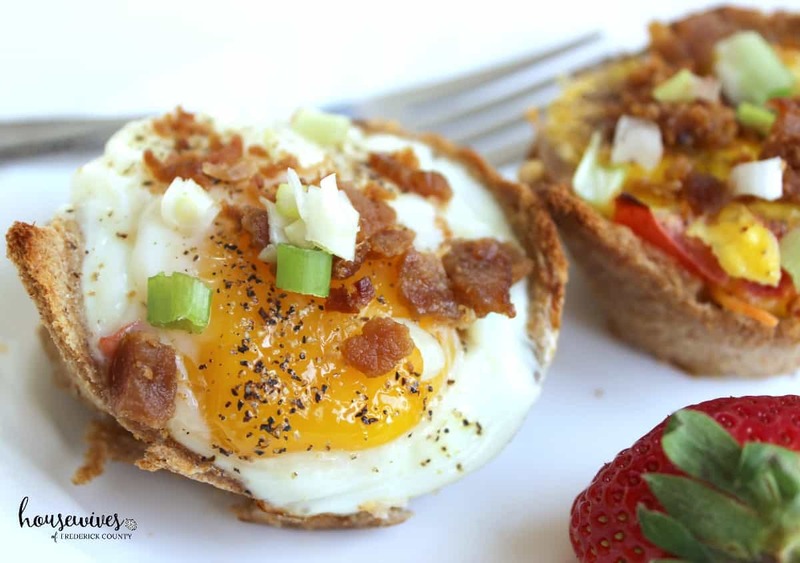 These egg and toast cups are seriously delicious! 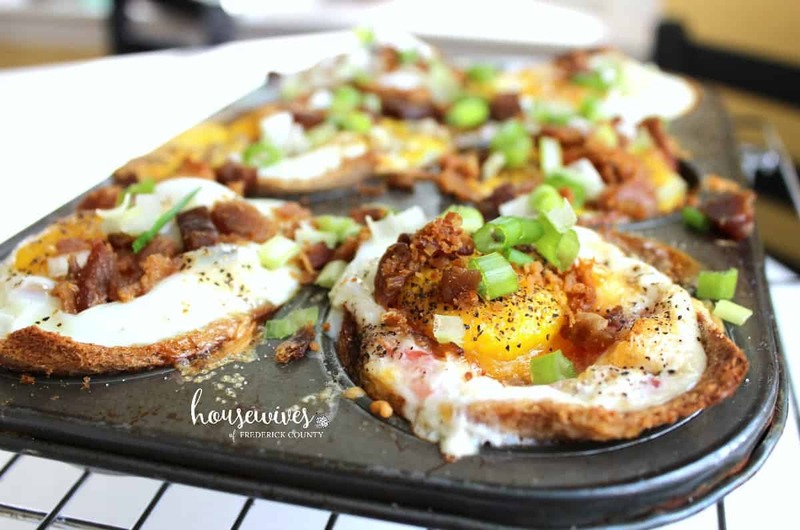 The combination of the cheese, tomatoes, bacon, spring onions, and a sunny-side up egg all enveloped inside a toasty vessel was heaven to my taste buds! 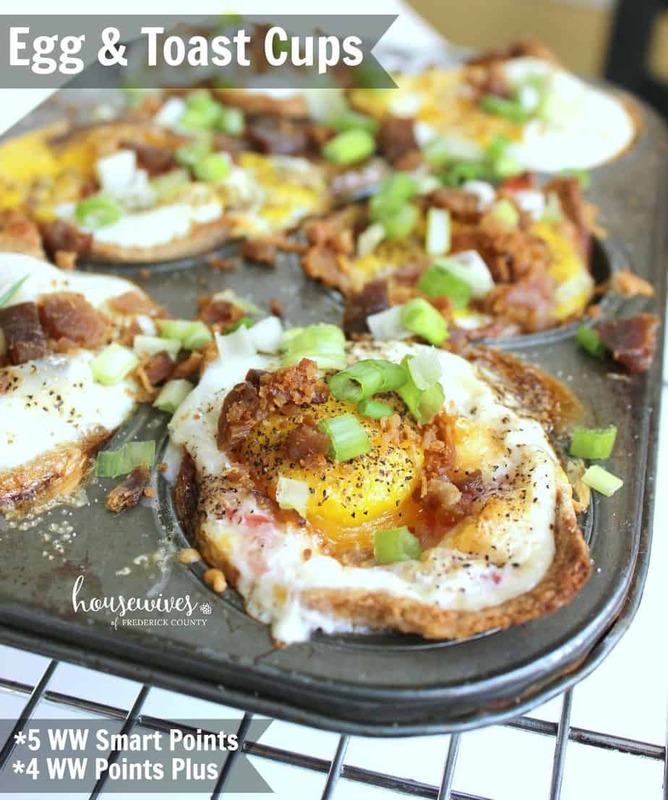 With a total of 11 grams of protein per toast cup, this is a great breakfast option to start your day off right. And the beauty of these cups is that you can make them in advance and just pop them in the oven to warm through when you’re ready to eat them. I’ve already got some in a container in the refrigerator for my husband to bake in the morning before he leaves for work. 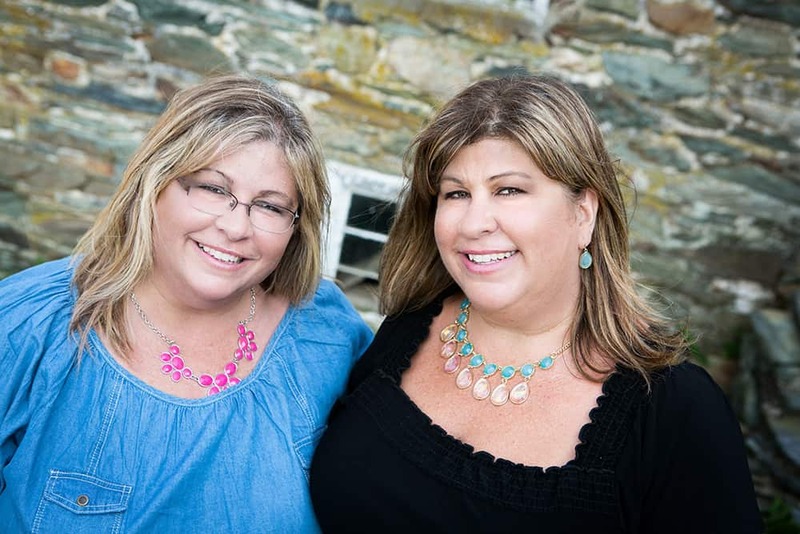 We’d love to hear back from you in the comments! Here’s to a Sunny-Side Up Day!